Nice Idea. I always do it in person though. Ask to speak to a manager and tell them and then show them, usually they just don't realise and will do their best to make it right, but it they don't warn them that you will be contacting the authorities. You know the problem is not always with the pet stores. Often times it's consumers who are unwilling to pay for the bigger hutch / cage...which makes demand for the smaller / cheaper versions much greater. You should see the faces on some customers when I try and talk them into getting a dog crate, or sourcing NIC cubes, or even using a shed, or making an indoor playpen. "We don't have the space" "It's too expensive" are just some of the replies. "THen don't buy the bunny and force them to live in crappy accomodation you moron" is what I'd love to respond. If people emailed pet stores about the slemka storage cubes that B&Q currently have on order, and got them to stock them, along with examples of the brill condo's you can make, or other alternatives - maybe they's listen. You need to provide the pet stores with cheap alternatives I guess - that would be in demand. Just my thoughts from working in a store. In my opinion most pet stores are only in business to make money. They will leave the education and welfare of animals to the rescue centres and welfare organisations. They will only sell what will make them the most money and where space is at a premium, they will sell items that make them the most profit per sq ft. Selling animals brings in the customers; lets face it most kids aren't going to get too excited about visiting a pet store that sells practical, suitable pet related items if there are no furries to look at. So pet stores will always think that they need to sell animals to get us through the doors. They need high turnover so that they don't have to care for the animals when they get ill or need special attention. They sell pet foods, toys and treats that actually appeal to the pet carer/owner and that are not necessarily suitable for the animal itself. How many of us have bought things that we thought the animal would like only to find that they would rather play with the packaging, much like children. We must vote with our feet. Any ideas to get the pet stores to listen to what is a minimum in terms of animal welfare is a must. Whilst the ideal scenario is that they stop supplying animals, I think that this is a long way off happening, so we must just make all stores realise that we won't spend our precious income in their store if they don't listen to us. Write letters, talk to the staff and tell them your concerns, lobby your MPs. pet shops are terrible i have had two rabbits die from pet shops and one another one had to be put down cause we discovered it had myxi. That's really good the guinea pig and rabbit one applies to my local pet shop so I will definitely use it. Thanks. Friendly Rabbit Forum for over 16's. Come and join everyone else over here!! My first rabbit was bought from a pet shop. The woman didn't vaccinate any of them before selling although she told us they had been. Thumper had caught something (don't know exactly what as I was only young). I only wish I was old enough to tell her what for, although my mum did. He had a very short life due to an accident which I will not go in to. We then bought Biscute from a respectable breeder. I would never buy from a pet shop unless I knew they were respectable and looked after their rabbits. I am now old enough to make my own decisions and I have to admit when I wanted another rabbit (or 2) going to a pet shop or breeder never entered my head. I wanted to rescue. I don't disagree with pet shops or breeders aslong as they look after their animals well. Hi, I am not too sure if I am repling in the right place. BUT I live in a smallish village, but this pet shop is so different, they actually care about their animals they sale. They only sale mainly fish, rabbits, guinnea pigs and hamsters, but all the animals have the correct and much more space. All the food, toys and all the other things they sale are reasonable priced(not like some of the bigger pet shops) They themselves are animal lovers, and have a dog that often greets the customers by wanting his tummy stroked LOL, and they have numerous of ferrets. It's a family run business and the sister has rabbits, if a rabbit is taken ill ( which at one time one of the babies were), they took home the ill baby and found out what was wrong and nursed him back to health, it wasn't anything serious but this is what makes me feel happy to spend money in their shop. Also, they sale information books on the animals including horses etc... they also give out information leaflets on how to look after the animal you are buying, it is only basic but atleast it gives you an idea to start you off. I thought you would like to hear that there are some pet shops that actually care about the animals not their profit margins. Last edited by Brooksey; 05-06-2008 at 10:26 AM. Reason: wanted to add more info. I work in a local pet shop in Fife during the weekends. I have worked there for over a year now and to be completely honest the majority of the time i hate it. When i first started i knew nothing and had no pets except 2 dogs. I got two rabbits and one of them had babies unknowingly. I have kept all 4 babies so now have 6 rabbits. After my rabbit had babies i started to sit for hours finding out everything i could on bunnies and found this site which has helped me alot. Anyway in my shop our animals get cleaned everyday with fresh food and water and at the end of the day get a bundle of hay (which i think they should have all the time) we never keep rabbits and guinea pigs together and tell customers not to keep them together. We give advice on Myxi, housing, food and cleaning. What i disagree is my collegues sell the smallest hutch/cage they can with the rabbits so the customer wont mind paying for it. And on occasion my colleges have FORGOTTEN to tell the customer to buy hay, which is very vital to the diet. Now my colleges have rabbits or guinea pigs of their own so how can they forget something s importana. Another thing i hate is some customers come into the shop with their children, the kids see cute fluffy bunnies, want one and ask for one, so their parents buy an animal without thinking about who will take the responsibility when the kids get "BORED" with their pet. Also the shop i work in sell almost no rabbit toys and so many unhealthy treats, i go to pets at home as they sell a larger variety of toys, so im going against my shop and paying more money for my bunnies. 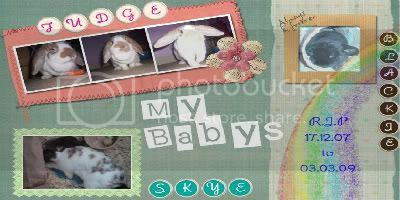 My bunnies are my heart and soul, they are not just 'PETS' to me they are my friends and a part of the family. My little girl fudge is my BEST BEST friend, she is the only one i can turn to when i need someone. They say dog is a mans best friend, well rabbits are mine. I wish people would treat them like they have feelings, because they do and they depend on us to live. Give them a chanceto be happy and they will give you and lifetime of happiness.